Today we’ve got a bunch of exciting new stuff for you. 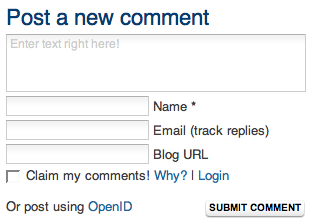 We’ve gone through and revamped our comment system, it is now faster, prettier, more usable, and easier to understand. Let us highlight some of the things that are new/changed. The menu button is gone, but we’ve replaced it with something much better. 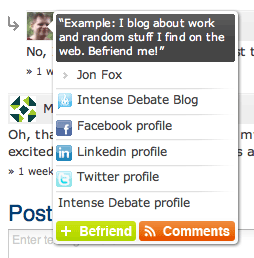 Say hello to what we call the “userbox”, a popup that appears when you hover a person’s avatar. It has all the information you need in it: Ways of contacting the person on other sites, a link to their Intense Debate profile, and a personal message that gives you more information about the person. It’s all about giving your commenters an identity. Go ahead, let the world know who you are! It’s easily done on your “Edit profile” page. We’re all about user feedback and improving over time. We saw that the comment system had become too cluttered, and so we cleaned up the structure and gave it a new appearance. We want to make sure that your blog has got the most sleek, useful, and cool comment system around. We’ve raised the bar again. While we’re all about improving, some of you felt like the “Post new comment” section was a bit too different from the ones seen on standard blog platforms these days. 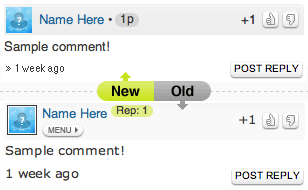 To help new commenters, and to give the comment system an even cleaner look, we’ve taken it back to the roots. You’ll now find that the fields for credentials are stacked on top of each other. Intense Debate has never looked better. Look out, though. We’re not even close to being done. This looks great! What about trackbacks? Its the only thing holding up my re-installing the comment system. And, trackbacks are coming soon! Looking good! The nice thing about ID is not having to update code on my side to receive new features. looks pretty slick! Keep up the good work boys!!! The new update does look great. I also share micah's concern over trackbacks though, it'd be nice to have one system handle both methods of feedback/communication. Sweet! So I gotta do a re-install ? We're truly glad to hear it. Let us know any and all feedback you might have at feedback@intensedebate.com! Thanks. No Chris, it is not necessary! That's the beauty of a JS-based plugin, you automagically have all the latest stuff.. Always! Hi, I just wanted to thank the team for this wonderful tool. I am happy that the search engines guided me to it yesterday. The fast setup within minutes made my day! is there something i need to do to enable the userbox popup on my blog? Thanks! Currently we offer trackback support with our WordPress plugin. We just released the latest version, v2.5 – http://wp.me/plsX6-wF . We hope to offer this in the future for other blog platforms.